With the coins this kind donor found in a large jar in his home, he sponsored a cow for one of our impoverished mothers. 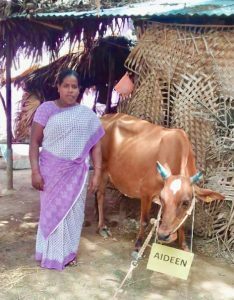 Nandri provided the mother with a micro finance loan enabling her to buy the cow which will give her family food, in the form of dairy products, an income from the products she can sell and in the future, a calf which will further boost the income of the family. Because of the increase in income, the children will be able to afford to continue their education. 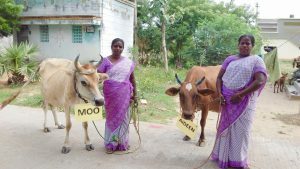 What a difference a cow makes in the lives of our poor families. This mother will never forget how a jar full of coins changed her life. Our generous donor called his cow Aideen after a family member! What would you name your cow? Update on our sanitation programme.